There were no Indians in action on the opening day of AIBA Women’s World Boxing Championships in New Delhi on Thursday but the results of the first day bouts have sent warning signals to the host pugilists that they have a very tough campaign ahead. In Fly (51), Feather (57) and Light (60)—categories all the favorites won their bouts rather easily. Though, the bout between Australian Staridsman Anja and Columbia’s Cordero Hernanadez in lightweight category turned out to be fuirious , fetching a split verdict (3:2) in favour of the Aussie. In the first round, the CWG gold winner Aussie got 10 points each from three judges while in the second she just about managed from two of the five judges. However, what made the difference was the third round when she unleashed a combination punches and a couple of straights which helped the 31-year-old claim to progress to the second round as she got full points from four judges. 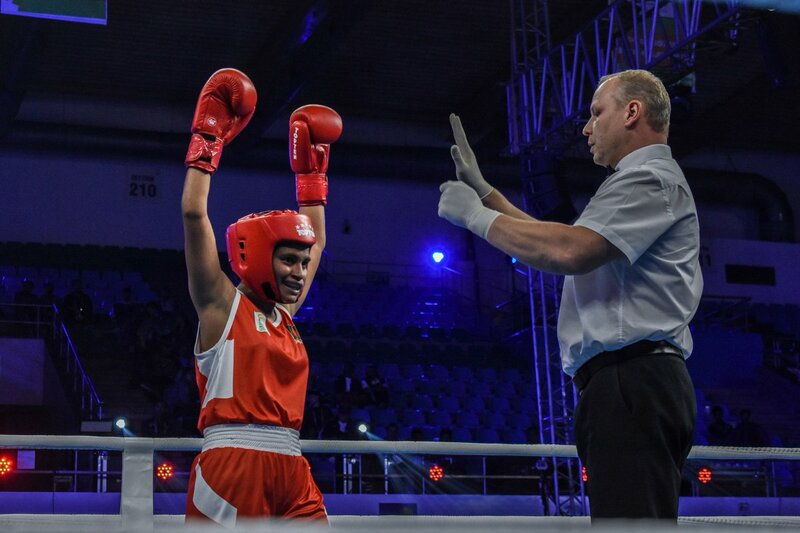 Diana, in her first-round bout, defeated Hasanah Huswatun from Indonesia 5:0, has been competing in world championships since 2008 but can’t match the guile and experience of the Manipuri. She was selected into the squad after her performance in the Indian Open and Silesian women’s event in Poland. Sarita Devi ,a multiple medal winner, who made her World Championships debut in Scranton in 2001,and was too happy to be taking to the rings at home after 12 years. When she competed last time at New Delhi in 2006, she won a gold medal and later followed it up with a bronze in 2008 at Ningbo City in China. The Haryana boxer, who won a silver medal after defeating former European champion Viktoria Kuleshova in the semifinals of Silesian Championships in Poland in September, said she was ready for the D-Day. “The exposure I got in Poland was great. I have prepared well and, with the home crowd support, would hope to do well,” said. She however admitted that the worlds would be a different kettle of fish and she has gathered information on rival boxers from her teammates, especially from veterans Mary Kom and Sarita Devi, who have given vital tips to handle tough situations during the bout. But the pugilist from New York is a wily boxer and has to her credit several international honours, including being the continental champion, also the twice bronze medal winner at the 2012 and 2016 world championships. Manisha, who is tactically good with a solid defence, hopes the tips she got from the seniors will come in handy against the American. However, Christina will use her experience against the Indian.